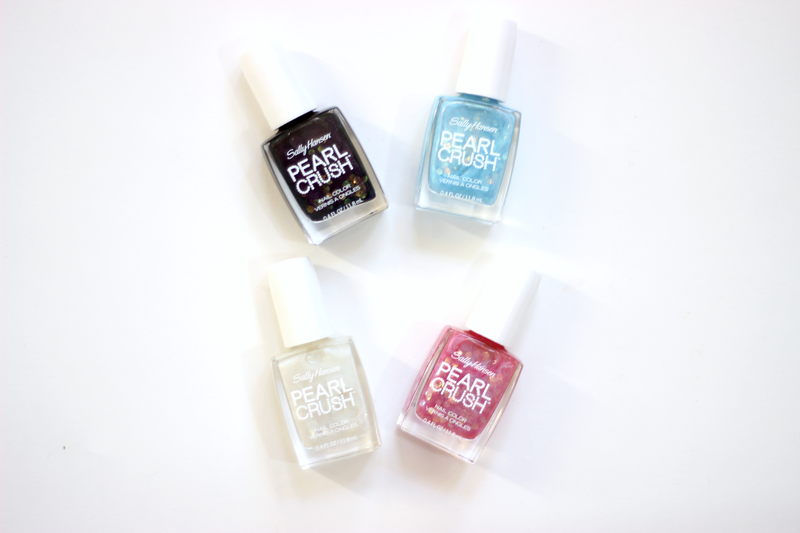 A few days ago I showed you the new Sally Hansen Insta-Ombre nail colors and now it's time to show you their other summer release- Pearl Crush. 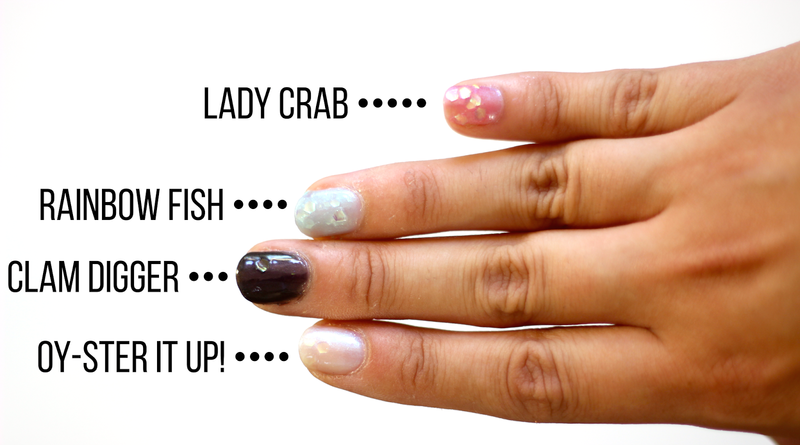 The Pearl Crush nail colors come in eight shades that will give your nails an iridescent look that's perfect for summer. These nail polishes are composed of a sheer nail color, tiny glitter particles, and large iridescent pearl-like particles. The Pearl Crush nail colors sound amazing in theory, but to they work? I have to say as excited as I was to try them out, these left me quite disappointed. Just like the Insta-Ombre nail colors, the Sally Hansen Pearl Crush Nail Colors come with special instructions that will help you achieve the 3D pearl look. First step, dab one coat of the desired amount on dry nails. Second step, dap a 2nd coat of polish and that's it. Seems easy, right? Well as you can see not every nail looks amazing. I personally found the dabbing technique splotchy for nail polish application, so I had to alter it a little. I did one smooth coat to lay on the base color, and then focused on dabbing to get some of the large particles on my nails. A problem that I have with the Pearl Crush nail colors is that the large particles are big and stiff, which makes it a tough to get them to lay on your nails. Some of them like to pile up and create a rough texture on your nails which I personally don't like. I also found that the brushes don't really pick up the large chunks very well. I would be dabbing and dabbing on my nails, only to notice that there were absolutely no large particles on the brush. The large pearlescent particles look stunning in the bottle, but unfortunately they don't translate well on your nails. This is why I think that this collection is a big miss and I would even suggest you skip it. Oy-ster It Up! : This is described as a true white, but I wouldn't necessarily call it a true white because the iridescent glitter gives this nail polish a yellow and sometimes blue tint. I would say that the base color is a true pearlescent shade which applies rather well. If it wasn't for the large chunks of glitter, this would be such a stunning shade. I really struggled getting the large chunks out of this particular shade, but when they would come out they would be broken into smaller pieces. Lady Crab: This is described as a dreamy pink, and that's exactly what it is. I found the base color to be a bit more on the sheer side, especially when I compare it to Oy-ster It Up! which did a good job of covering my nail bed. While the base color wasn't the most impressive, I do have to point out that the large chunks come out with so much ease with this particular color. If you're looking to get the true Pearl Crush effect, I would suggest going with Lady Crab. Rainbow Fish: This is described as an icy iridescent blue and I would definitely agree with the description. Just like with Lady Crab, Rainbow Fish's base color is a bit on the sheer side which helps once again with picking up the larger pieces of glitter. This does give you the Pearl Crush effect as well, but I felt like it made my fingernails look like I'm getting frostbite. Clam Digger: This is described as lava-rock black with flecks of phosphorescent-green glitter. This is by far the color I was the most excited for and the one that disappointed me the most. I loved the contrast between the black and green glitter, but it just doesn't translate well on your nails. Once again I felt like this color made my nails look like they had frostbite. I went from the frostbite kicking in with blue nails, all the way to the worst possible state- black nails. I also have to point out that I once again experienced trouble getting the large particles on my nails. I was only able to get one on on the swatch, and even when I tested this color out I could only get one or two to show up per nail. And that was half of the Pearl Crush collection for you! I was quite disappointed with these and unfortunately I can't recommend any of the shades that I tried out. It's a cool concept but sadly it doesn't translate well onto your nails. Did you like the Pearl Crush effect? Will you be picking up a few shades? Please let me know in the comments.